As you walk along the trails you will pass oak, maple, aspen, hornbeam, birch, tall cedar and jack pine trees, some identified with metal labels. The reservation is known for its beautiful wildflowers, including lady slippers, jack-in-the pulpit, Indian pipes, cardinal flowers, starflowers, Solomon seal, and many other specimens that have been catalogued by John Gould, an Andover authority on wild flowers. Fugitive domestic vinca carpets the northern portion, competing with native poison ivy. Partridgeberries and club mosses act as groundcover elsewhere. Fern and skunk cabbage abound in wet areas. The wet meadow near Coventry Lane, flooded during wet periods, offers a large area of an interesting variety of shrubs and plants. During the 17th century, the land comprising Taft Reservation was owned by the Bradstreet family. Anne Dudley Bradstreet was the first published English language poet in the New World. On a darker note, during colonial times public executions were held nearby. In 1689, Hugh Stone was hanged for the murder of his wife, the mother of his six children. In 1748, the first mill on Taft was started by Henry Gray II using power from a branch of the Skug River for grinding scythes. A descendant, Henry Jenkins Gray, added a sawmill in 1853 that existed until its demolishment in the 1930s for a Civilian Conservation Corps camp. Broken millstones and rusting barrel hoops can still be found along the stream. The Taft name emerged when the Reverend Arthur Taft, a retired Episcopal priest from Colorado, settled in Andover. His family purchased the Gray property in 1932, which his three children (Alexander, Rebekah and Frederick) inherited on his death in 1967. Rebekah Longwood Taft, long interested in conservation and an AVIS trustee in the 1960s, donated to AVIS much of the Taft reservation (30 acres). The land was named in memory of her mother, Amy Gordon Taft, and is to be preserved forever in its natural and unimproved state. 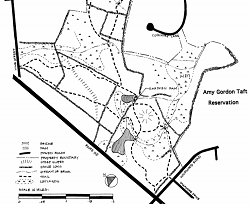 A 1997 AVIS purchase of an additional 19 acres made possible trails to Salem Street and the Town’s deeding over the conservation parcel of Coventry Lane extended the reservation to its present size of 64 acres. An observant visitor can find abundant evidence of Taft Reservation’s agricultural past. The trail passes by stone walls, ruts cut by ox-drawn carts and an abandoned apple orchard. There is a depressed aqueduct that was used to divert water into a cow pond. A few old buckets can be found in the thickets left over from the days when this area was a working dairy farm. Between Route 125, Wildwood Road, Vine Street, and Salem St.